For those who have big fingers, typing messages with the default android keyboard can be very slow and irritating task. The situation even gets worse if your phone has a small display. However if you need a alternate and faster method for typing messages on your android phone, you should make use of the Voice dictation feature that comes built in with your android phone. Generally most of us are aware of Android’s text to speech feature but when it comes to the Voice dictation feature, it something not most of us are aware about until you accidentally tap on the mic icon on the default android keyboard. The same thing happened with me and thus I discovered android’s Voice dictation feature. 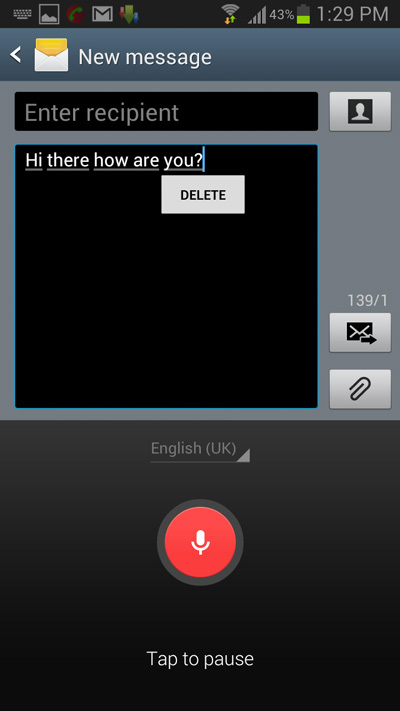 The voice dictation feature is usually present on all android devices that run on Android 4.0 or later versions. If you need to use the voice dictation feature, here’s how you can use it to type messages with your voice on a android device. Step 1: To use the voice dictation feature, open any app and bring up the default android keyboard by tapping on a text entry field. 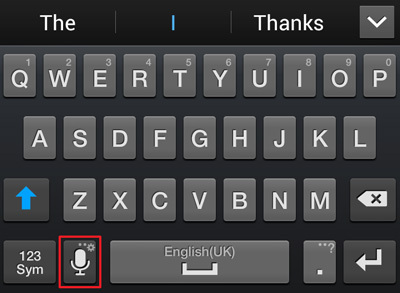 Step 2: Next tap on the mic icon on the android keyboard and start speaking after the beep to record your message. Step 3: When you are done speaking, tap on the mic icon again to pause it. However you have to keep in mind that the voice dictation feature won’t insert the punctuation automatically and you will need to speak out the punctuation marks. The following are a few voice dictation commands for punctuation. Surprisingly even if I have an Indian accent, the voice dictation feature worked flawlessly without any error and it should work flawlessly with any accent. As for limitations, the voice dictation feature doesn’t work without an internet connection and neither it has any voice commands for editing messages, which you have to perform using the keyboard only. Be it short messages, notes or quick emails, the Voice dictation feature on android would definitely server your needs for sending messages faster than any other traditional input methods.